Kicker Brandon McManus #8 of the Denver Broncos kicks a field goal against the Seattle Seahawks at Broncos Stadium at Mile High on September 9, 2018 in Denver, Colorado. Brandon McManus basically won the game in the Denver Broncos' 27-24 victory over the Seattle Seahawks. 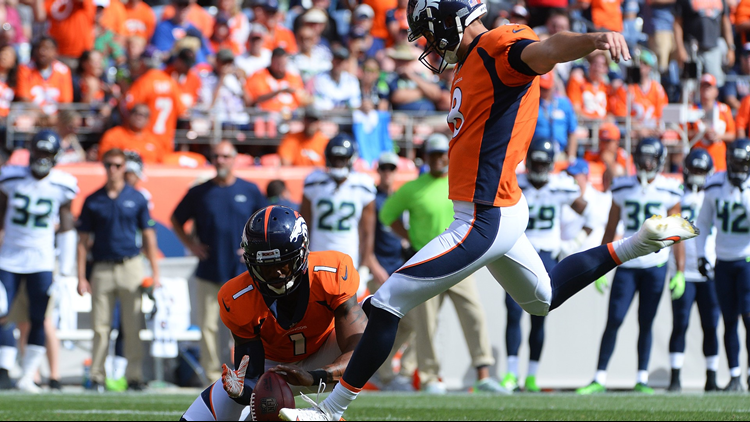 DENVER – Brandon McManus has his kicking groove back. Including his perfect postseason of 2015, McManus was 44 of 44 on field goals from inside 40 yards in the 2015-16 seasons. He then missed three field goals from inside the 40 last year, and overall he slumped to a .750 conversion rate after posting .857 and .853 the previous two years. McManus has been true again this year. He was 9 of 9 in field goals and 8 of 8 in extra points during the preseason until he missed a final, 57-yard field goal attempt at Arizona.